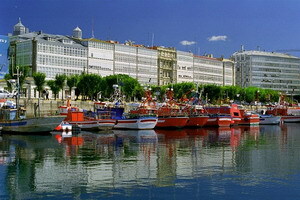 A Coruña, with its lovely glass fronted houses looking out over the harbour and port is a city not to be missed. There is plenty to do for a great day out - excellent town beaches, superb seafood and fish, quaint little old bars, brilliant nightlife, very good shopping - all the latest fashions, Zara and Mango included, as well as some wonderful old fashioned shops selling all sorts of things you might not find anywhere else in this modern world and it is home to the football team Deportivo A Coruña. It has the only working Roman lighthouse in the world which you can climb to the top - 242 steps!, a fantastic maritime museum/aquarium, other very interesting museums, romanesque churches, enchanting old squares and the beautiful square of Maria Pita where you can visit the impressive town hall and sit out at a café and watch the world go by and you can visit the tomb of Sir John Moore. If you are an early bird do not miss the fish auction held at La Marina to watch the spectacular unloading and auction of the night's fishing catch. And why not hop on a tram - a fun way of getting to know the very Galician city of A Coruña.